From beginning to end 'Message in a Bottle' will draw you in and keep you so connected to the story you can't put the book down. It's that good. An excellent read - better even than the movie and it's my all time favorite! A definite keeper! i got inspired to read the book when i saw the movie adaptation...much to my surprise, i even liked the book better! the book really contains a lot of emotion and realism that only nicholas sparks can capture. A film has been made of this romance by Nicholas Sparks (who clearly follows a recipe when he writes his books). 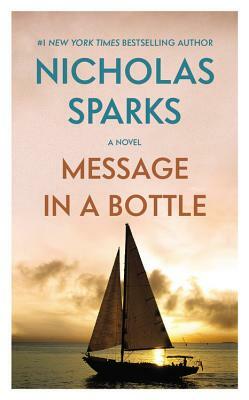 A beautiful letter in a bottle leads a curious journalist to a beach town where she discovers and gets to know the author of the letter. The consequences of this are far-reaching. Sparks has the ability to take the simple, move it into the complicated and from there touch the emotions. When I read this book I eventually sat with a box of tissues next to me, tears pouring down my cheeks for the love lost that is depicted. The movie had the same effect on me. Relationships are wonderfully written by Nicholas Sparks. Be prepared to feel a whole range of emotions with this book.